In honor of National Adoption Month, here’s my review of Jaymie Stuart Wolfe’s excellent discernment guide, Adoption: Room for One More?, from Pauline Books & Media. A few years ago, between babies #3 and #4 (or #4 and #5), my husband and I contemplated adopting a baby girl from China. We were moved by stories about baby girls being either aborted or warehoused in orphanages because of the cultural preference for male children. We decided to ask St. Therese to tell us whether we should adopt by showing us a rose — a red rose for yes and a white rose for no. The next rose we saw, blooming outside our kitchen window in the dead of winter, was off-white with scalloped red edging around the petals. We didn’t get an answer, or at least not a very clear one. 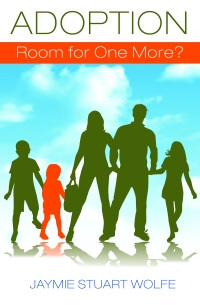 We would have been better off discerning with the help of Jaymie Stuart Wolfe’s new book Adoption: Room for One More?.Wolfe’s book is a series of 38 short chapters containing a spiritual reflection, a personal story, and practical descriptions and advice regarding the adoption process. For anyone discerning the call to adopt, I’d recommend reading this book at a rate of one chapter per day, taking 24 hours to pray about each facet of your decision. Wolfe’s hope is that many more families will consider whether it’s God’s will for them to adopt a child. As her personal story proves, having adoptive and biological children doesn’t have to be an either/or choice. Wolfe and her husband had seven biological children before deciding to adopt their eighth child, Yulia (now Julianna), from a Russian orphanage. My husband and I are not adoptive parents (so far), but we know many couples who have adopted internationally or domestically, some through the foster system. Even though we’ve listened to our friends recount their adoption stories, Wolfe’s book gave us a much clearer picture of the struggles and blessings of the adoption process. The questions at the end of each chapter include three for potentially adoptive parents and one for friends and family of adoptive parents. Reading over those questions made me realize how much more support we could have given our friends who chose to adopt. Just as Kimberly Hahn’s book Life-Giving Love taught readers what to say to women suffering from infertility and miscarriages, Wolfe’s book teaches us how to talk to adoptive parents. There is an entire chapter entitled “A Language of Love,” explaining how adoptive mothers are “real” mothers and adoptive children are the parents’ “own” children. Wolfe is definitely fluent in this language of love, and she provided immensely valuable advice to me and my husband when we covered the subject of adoption in our own book on Catholic marriage. There are a few things I was left wanting to know after finishing Wolfe’s book, mainly because I’m insatiably curious. I wanted to know who watched their seven children while the Wolfes traveled to Russia numerous times to adopt Yulia. And I badly wanted to hear the story of Yulia’s baptism and how they reassured her that God had always loved and cared for her even during her traumatic early years in Russia. But as a wise editor once told me, an author always has more words to write. I suppose those stories will have to wait for another day.